Just because you have children is no reason to swear off traveling. For the wander lustful parent, the richness of the world can be enhanced by the experiences of your own children, so long as you always consider their interests, and desires when choosing destinations and making itineraries. 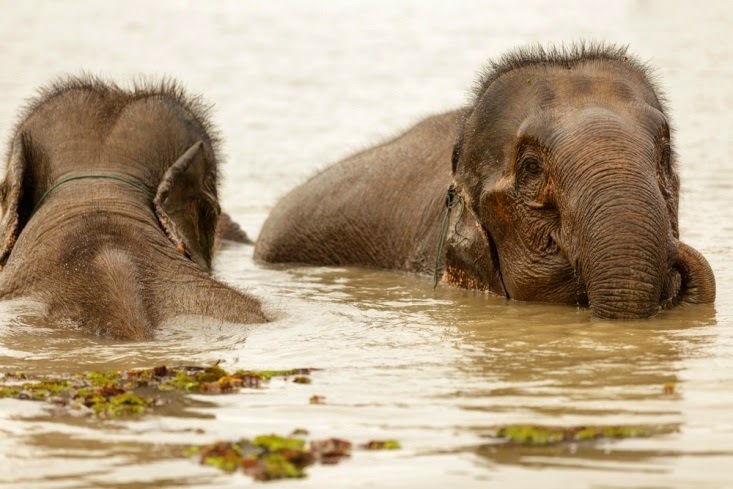 The only landlocked country in Southeast Asia, Laos is a great place to take your children and yourself, because it has plenty to offer a traveling family — after all, one of its nicknames is "Land of a Million Elephants," and everybody wants to see elephants, right? A lush and tropical country, almost 2 million foreigners visit each year, so traveling with children there won't feel like pioneer work although it is certainly one of the more off the beaten paths. You will discover it is more rustic than it's neighboring country of Thailand but that simply adds to the excitement and adventure. For a fun time in Laos, where children and adults can enjoy their time together, head toward the following places and experiences. Exploring and swimming are both easy to do at the Kuang Si waterfall. Get there early since most tourists arrive after 10 a.m., and up until that time, it will feel as though you're the only ones in the park. You'll need to take a tuk tuk out and back, so be sure to factor that necessity in with your budget. There are plenty of restaurants around the waterfall for whenever you get hungry, so there's no need to worry about packing enough food for you and your brood for the whole day. Ideal for kids who are good swimmers and eager to explore, even introverted and shy children will enjoy their time here, so long as you accompany them in and around the water. Take a full day tour at Shangri Lao, where you can explore the camp with a guide on foot. Visit the veterinarians in the elephant hospital, and enjoy a meal or snack by the river. Ask questions and learn about the lives of the elephants in that region and throughout the world. The elephant ride wanders through teak forests, thick jungles and up and down hills until you and your family reach the Huay Sae Valley, where you'll hop on ponies more suited to the increasingly difficult terrain. After about half an hour of stunning views through more forests and jungles, you'll end up at the Nam Khan River, where a bamboo raft will guide you lazily back downriver to the Shangri Lao camp. Note: I strongly suggest you do some due diligence on elephant riding. The methods used to get elephants, train them to accept riders, and the pain the baskets cause them is really enough to have you skip it. But you can still enjoy the elephants and see for yourself what their lives are like. 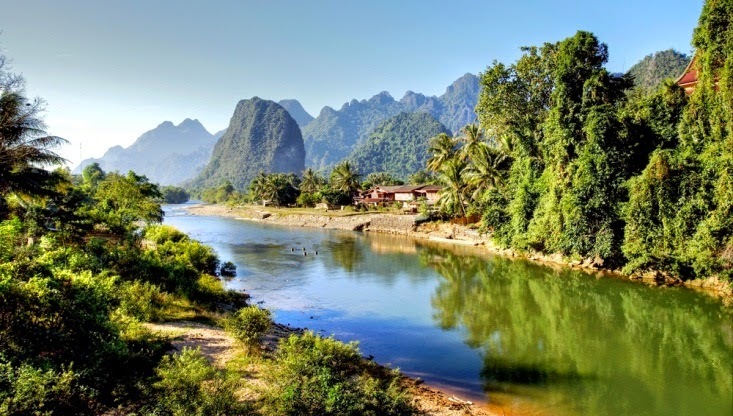 Another excellent tour opportunity for adults and children can be had in the small and picturesque village of Vang Vieng. The tour starts at a historical cave that Laotians used as a defense bunker against the Chinese back in the 19th century. From the cave you can see breathtaking views of the landscape and areas surrounding you, which is why it made such a helpful and formidable bunker. From the cave, you'll head out to visit a plantation and another scenic village, before enjoying a boat trip along the Nam Song River. When the sun gets higher in the afternoon, you and your family will hop on bikes for a trip through the countryside, where you'll see rice fields, caves, and small villages. A tiring but beautiful trip, this tour provides ample opportunity to see the land and learn about the history and culture of the region. Alternatively, you can skip the tours and go it on your own. The locals are super friendly and the roads are not heavily traveled so bike, motorbike, or even walking are all great ways to get around and explore. We spent about 1 month in Vang Vieng and had the time of our lives. Rent a scooter and explore for every rice field or dirt road leads to one spectacular view, cave, or lagoon after another. One more elephant-based reason to take your family to Laos , the Elephant Village has a bit of a sullied reputation for being over-priced and touristy, but your kids will totally eat it up, so it's still worth a visit. Elephant rides are available, including riding like a mahout where you and your little ones can steer the elephants by voice and foot commands. Ride, pet, feed, learn — the elephant interaction here really is top-notch, and every now and then you'll get lucky and see a baby elephant, too. If you don't mind the expense, you can also relax in the pool and bar, too. Note: If you are going to ride, please consider doing it like the mahouts do rather than the bulky baskets. It is easier and more familiar for the elephants that way. We rode this way in Thailand and it was an incredible experience. We researched the camps heavily in order to find one we felt rescued the elephants and treated them well but even still I am not sure we would do it again. Learn to cook Laotian food with your kids at one of the cooking schools in Luang Prabang. All of the schools will give you a crash course in basic Laotian cooking, and some actually cater toward children, so they'll feel more included and have a great time. The best part is that when you're done with your class, you get to sit down and eat what you cook. Even kids who usually eschew the kitchen will love this part of your Laotian adventure and just thin of the culinary treats you can cook for your friends back home! So, head to Laos with your wee ones in tow, and discover for yourselves why traveling the world with your children can increase every one's awareness and appreciation of a brand-new place. I'm happy you researched the right elephant spots to visit, as some folks are not up to date on the terrible practice of using large baskets on these chaps. Destroys their backs. Well done, and super responsible of you! The top picture screamed "Laos." Was it from Van Vieng? Looks like it. I loved our stay there although during those days it was a bit wild....still a party town, and a whacky party town at that. Not our speed so we had dinner, watched some Family Guy - without the mind controlling stuff - and simply observed the stunning karsts around town, then called it a night. We liked Laos, and I see it as being fun for the whole family.The bus rides up north to VV, and outside of town, to Luang Prubang, were a bit rough, but overall we enjoyed our stay in those 2 towns as well as in the capital. Fascinating culture, and one of the more beautiful places we seen on earth. The mountains are stunning, really something else. Thanks Ryan! Yes I agree about the elephants, and one look in their soulful eyes tells their tale! I can't condemn it all together because it is through elephant programs that people gain a love for them and the desire to research more and ultimately help. But definitely needs to be done responsibly! The photo is from Vang Vieng! We loved it there too, went over 2 years ago now so it was still total party town. Even with the kids though we loved it, great comedic value and the tubing was excellent! We had a blast! We didn't hit LP because after the trip to VV we had had it with bus travel in that country:) But we also loved Vientianne and wee just so overcome with how lovely the people were and by how little we knew about it before we went! It was our favorite country in Asia! Perfect timing Mary. We are heading that way in mid November, so will check out all that you mentioned. Our one stop in Laos was Luang Prabang. After the traffic and sometimes crush of people in Chiang Mai, Thailand, we really enjoyed the laid back vibe in Luang Prabang with its dash of French je nais cest pas (sp?). We did our elephant experience outside Chiang Mai at the Elephant Nature Park, an elephant rescue sanctuary. No elephant rides. Oh how nice! I have heard the elephant sanctuary is the best spot but pricey for 5 people so we didn't do it! Pai was a great spot, one of our favorites, and we were able to have lots of elephant experiences there. We did ride once, after researching and discussing with the owners of the elephants. We rode mahout style and really enjoyed it even though it was a very short ride!